Sometimes, strolling through an Algerian market gives you a chance to interact with the locals, find the different perspective of life but also discover interestingly exotic and new ways to wake up your tastebuds. Just like this weekend, when I encountered this strange yet tasty little fruit. The seller told me they were called "arbouse" in French or "el lendj" in Algerian Derdj meaning "wild forest strawberry". Very unique little thing. I'm actually surprised I havn't come upon these things before, in all the years of living here in Algeria. Slight anise-like scent, I popped one little crimson grape-sized fruit in my mouth. The outside hairy on the tongue. It was firm, the flavor mildly tart and enough sweetness to be completely addictive. The inside yellowish orange with several small edible seeds inside. It tasted like a cross between a raspberry and a pomegranate seed. Kinda reminding me of the texture of passion fruit. Finishing off the fruit, I found my lips all stained a bit orangey- red. 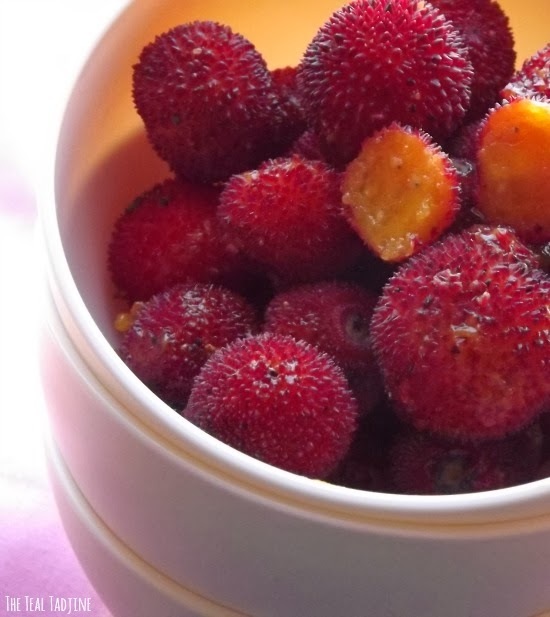 After doing some research at home, I found that this little fairy fruit's proper name is Arbutus unedo. And if you know Latin, then you'll know nedo (YOU-nee-doe) means “I eat only one” from the Latin unum edo. Not sure, why they called it that. Prehaps eating one was enough? Or because eating too much can leave you a bit dizzy and nauseaated. 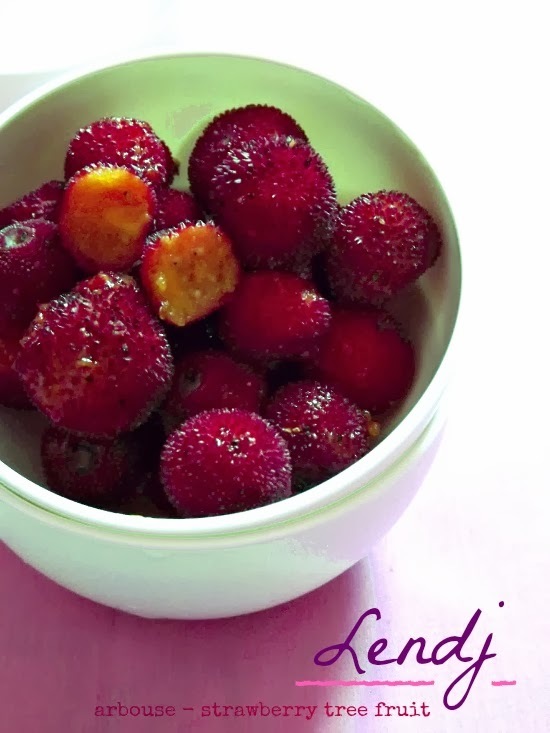 It's also known as Strawberry Tree fruit in English, Irish strawberry tree in Ireland, Madroño in Spanish, Corbezzolo in Italian, Koumara in Greek, Chachnou in Morrocan, and Sisnou in Berber. It's usually mistaken for Myrica rubra Waxberry in English, or Yangmei in Chinese,Yamamomo in Japanese and sometimes marketed asYumberry. But in fact, it is a different spieces of plant native to the Mediterranean. The Strawberry Tree is well represented in the Algerian Tell Atlas Mountains and is native to the Mediterranean native to the coastal regions of the Mediterranean, extending from southern Europe to western Asia and northern Africa, where the climate is mild and the summers dry. The strawberry tree is in the Ericeae family, including the cranberry, blueberry,huckleberry and azalea. They're usually found in the holm and cork oak forests of the lower mountains and flat country and is characteristic of the Mediterranean landscape from sea-level to 700-1000 m. Although it grows spontaneously in different types of soil it does best in loose, sub-acid subsoil and in sunny areas not subject to frost. Its fruit is an important food source for forest animals during the winter. The fruits are collected wild in the Autumn months from October to even early December by teenagers and sold along the road in small 500g cartons. The fruit is edible, rich in sugar and vitamin C, but has never, even in ancient times, been considered as particularly good when eaten raw. Cooked, the fruits are used in recipes to make jams, sorbets and drinks. Strawberry Tree fruit are very low in calories (28kcal per 100g) and very healthy, as they are high in antioxidants, ellagic acid, vitamins, and minerals, including vitamin-C, thiamine, riboflavin and carotene. And very, very tasty! They only lasts a few days in the refrigerator, so they need to be consumed fresh in less than 3 days from when they are picked. I saved half the container I bought to cook with the next day, but I found it already rotting and starting to ferment its sugars into alchohol. If you get your hands on this fruit, you can use it in recipes that cal for raspberries, blueberries, and blackberries; just use more sugar. 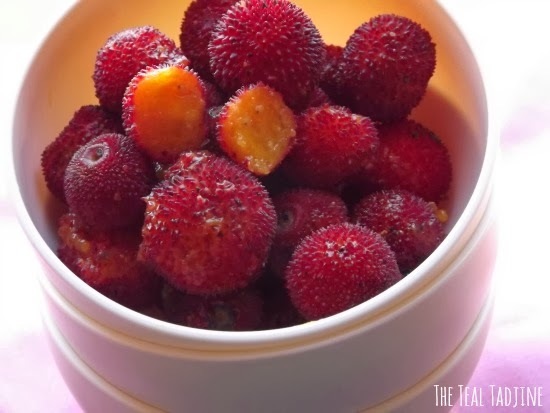 Strawberry tree fruit would need less cooking time, 10 minutes instead of 15. Algerians, usually make jam with this fruit. For the prefect taste, start with 1 cup sugar to 4 cups fruit while cooking the fruit, and add more later to suit your palate. I bought mine from a travelling herbalist in my local market, who told me he picked them off wild strawberry trees near Chiffa. But if you'd like to get a look at the tree itself head over to First Ways or here. And Narwen of NarwenCuisine has a nice juice made from this fruit. HAVE YOU EVER EATEN THIS FRUIT?